Let's Talk About Cultural Differences in Skin Care/Beauty Ideals. Okay, okay, this is kind of a late morning but still, a morning for me. Since it is still extremely hot I really have no motivation to even get out of bed, plus I have the feeling I really did enough last week to let me rest a day or two. Let's try something different today. While I really love to make products reviews or showing outfits I feel that a little bit of substance is missing here and there so I want to start this series called "Let's Talk About" where I'll adress various topics and issues that I find interesting but still have a cohesive theme with this blog. I really love to write and these posts might have a lot in common with the research that I am doing, so please let me know how you like it! :) Without feedback this blog is not able to grow into something you all like. Now today's post is a topic that I wanted to talk about for a long time: Cultural differences when it comes to using beauty products or even ideals of beauty. For obvious reasons, the range of products available in one country and the dedication spend with these products can tell us a lot of the particular beauty ideals in these countries. Me, being a person that mostly was influenced by the European cultural context had so many things I was surprised by when I first came to Asia and I think it really is very interesting. In Europe, Asia is very much known as "beauty obsessed" with Japan and Korea having the image of being the cultural groups that care (people always say obsess but I find that a bit too negative) the most about their skin and outer appearance. 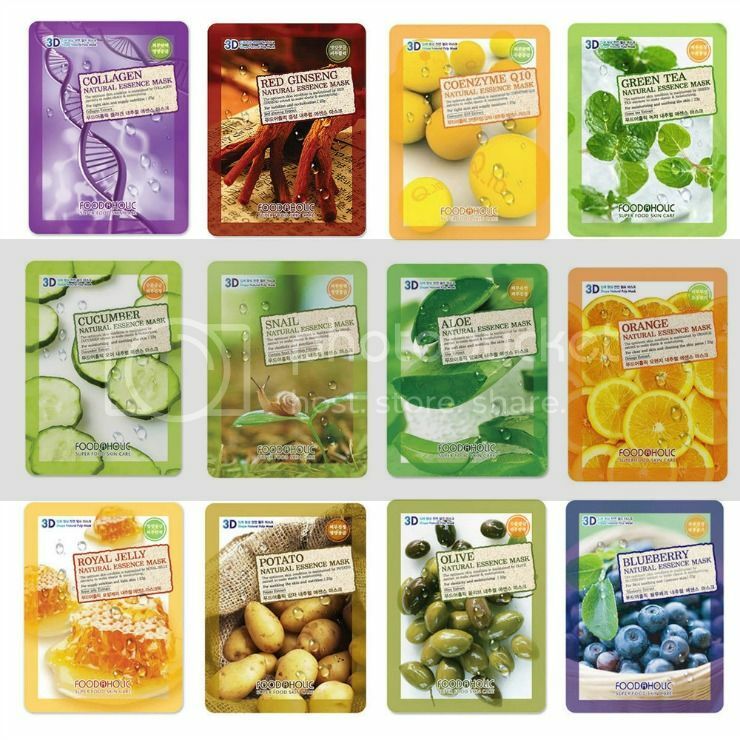 Don't you even dare to think you will find more than 3 different face sheet masks in Germany; consider yourself lucky if you find more than one! I cannot speak for whole Europe, so let's focus on Germany. In Germany people of course care about their skin. We have beauty ads, a lot of products to care for our skin and most German (women?) have a more or less skin care routine, but that's about it. When I first came to Asia, the range of skin care products was hitting me so hard I had no orientation whatsoever. The basic skin care routine in Germany of the average person is: Cleansing and Moisturize (often combined with Anti-Aging creams from a certain age on.) These two are seen as the basic and sufficient skin care. You clean your face once (or twice, if you are adventurous) and then slap some cream on your face to moisturize and then you're good to go. Of course we do have toners and serums and also face masks available but for some reason, the majority of people doesn't seem to care too much about these. They are for those people who are "into beauty" (not meant as a compliment usually) and people who get too obsessed or use more than 3 products in one routine can easily get judged by being shallow or artificial. On the contrast, we have Japan and Korea. Since I have not yet been in Korea I will mostly focus on my experiences in Japan, which I think is comparable if you bear in mind that Korea is always having a bit more of everything from the things I've heard so far. When I first came to Japan, I was so confused by the average drugstore: they had creams, lotions, emulsions, serums, essences, cleansers in every form and color. That was so confusing for me, the girl that was very educated in beauty compared to most Germans but still, that range of products was extremely new to me. I once tried to find a new cream, in the German sense. I failed badly. I had absolutely no idea if I need a cream or a lotion or maybe an emulsion... the difference was absolutely not clear to me and most drugstore personal was rather more confused by my questions than that they could help. Reading about Korea makes the case even "worse", learning that a lot of Korean have a beauty routine that consists of 10 or more steps (going all the wayu up to 17 as far as I have heard.) which I personally find to be impressive. But why is that so? Where are these cultural differences coming from, why is the product range so extremely different? Why do we have a tiny aisle in German drugstores with some cleansers and creams and sometimes there are complete stores (more than one floor, of course) dedicated to skin care in Japan/Korea? Uhmm... yeah, not much to add I think. 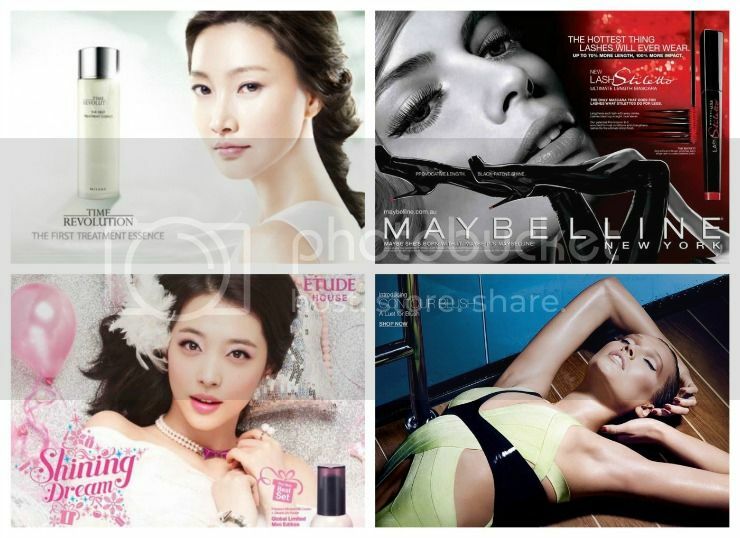 While all these ads are targeting beauty in some way the approach and overall focus is completely different. This reflects the overall trend; of course there are also beauty ads who only focus on the face especially when it's for foundation. But if you take Japanese magazine and a German one and just scroll through. the differences will just become more apparent. Relating to this, it is also very interesting that there is not also a difference in the skin care routines but the overall product are designed for completely different consumer markets, meaning that they are targeting very different issues. When I am living in Asia like I am right now I am always baffled at how good the skin of the average women looks. I was thinking it may be something in genetics that make them all look so smooth and healthy but I came to think it might not only be that, but also a much bigger dedication to skin care or caring about the body in general (I don't even start with Japanese vs German food because it will get very depressing for my European readers I fear.) which leads to a massive product overload in order to satisfy these needs from the customers. I would still have a lot to add about this topic, me being a German fighting my way through skin care kingdoms like Japan and Korea, but this post has to end. If you liked this post and wish to read more articles like that let me know! I had a lot of fun compiling this article. Also if you are particularly interested about a topic let me know please :) I will also make an article about my particular research which involves blogging and cultural differences because a lot of you were asking me about it. Thanks if you read this far!